Using CBD oils therapeutically is far from a new or recently developed practice. During the 12th century, Hildegard von Bingen, a German herbalist and nun, used cannabis and hemp to heal wounds and treat pain, intestinal issues, and psychological disorders. She documented her treatments in the book Physica; given the relative lack of modern clinical studies, it is still referenced today when touting the benefits of cannabis and, specifically, CBD. Now, we’re seeing CBD infused in every possible medium. It’s being adding to fresh juices, baked goods, and beauty regimens. 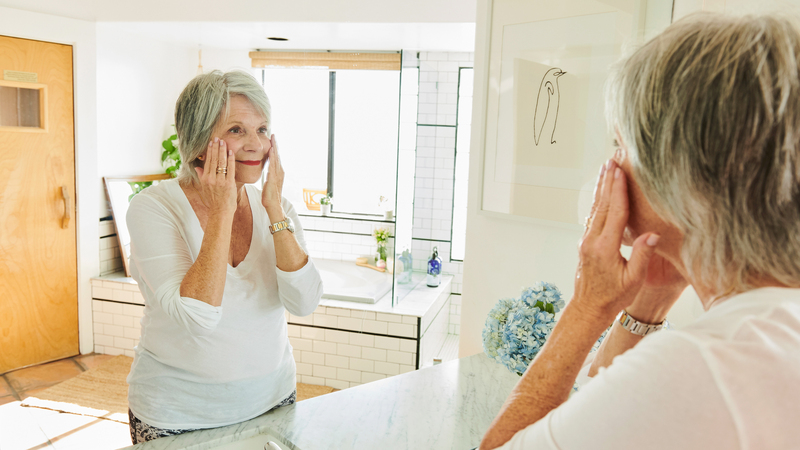 More recently, the CBD facial has been gaining popularity, now appearing on lists of services offered at a range of spas and treatment centers across the country. These facials are frequently marketed to oncology patients because of the calming and anti-inflammatory benefits. But the truth is, we can all benefit from the luxury of CBD oil spa treatments like the facial—and it’s easy to recreate the experience at home. During a recent visit to Ildi Pekar’s Wellness Studio in New York, Pekar discussed using CBD oil for wellness and skin treatment, as well the inspiration behind her line of CBD-infused products and her CBD facial. Two years ago, Pekar’s closest friend was diagnosed with cancer; having already experienced the calming and anti-inflammatory benefits of CBD, Pekar wanted to create a treatment her friend could enjoy mentally as well as medicinally. Though the treatment is listed as a facial, Pekar believes it’s more of an “experience”, which is an accurate description. There is a meditative quality to the facial that is more pronounced than that of a massage, and the glow it leaves you with can be credited to the relaxation prescribed by Pekar. But one does not need to visit Pekar (or one of the many other spas and wellness centers offering similar services) to enjoy a CBD facial. How, exactly, can you recreate this experience at home? Pekar’s favorite mask recipe is incredibly simple: a mixture of CBD oil, sour cream, and parsley. But she also stressed the importance of making a mask that is tailored to your treatment needs. Cannabis, just like mint or tumeric, is a powerful ingredient when considering wellness, so the oil should be mixed with ingredients that are healing for you personally. Both Pekar and Hinchliffe share an interest in products devoid of dyes, artificial ingredients and fragrances, and potential allergens, in addition to using high-quality cannabis from which to make your CBD oil. In her book, Hinchliffe includes recipes for making oils at home, as well as a simple “skin-renewing rosehip scrub” that also acts as a clay mask. The scrub calls for ½ cup of Moroccan clay powder, ¼ cup of rosehip powder, ¼ cup of CBD oil, ⅓ cup of fine-grain sea salt, and either orange or rose water. Most CBD users are likely already in-tune with the bodies’ needs to some degree, so creating a simple mask that combines the calming and anti-inflammatory benefits of CBD with other fresh ingredients tailored to what ails you is a feat all of us can accomplish. And, as Pekar advises, when you’re concocting your own CBD facial, think about what you want to feel afterward as much as how you want your skin to look post-DIY treatment.